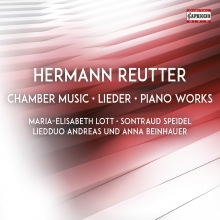 Hermann Reutters compositional talents were already being recognised in 1923 when he became acquainted with musical modernity at the festivals in Baden-Baden and Donaueschingen, where he met Paul Hindemith. In 1956 he assumed the post of Rektor at the Hochschule für Musik und Darstellende Kunst in Stuttgart, which he retained until his retirement. 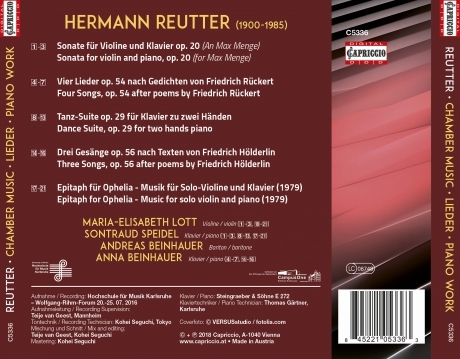 Reutter's early compositions reflect the stylistic influences of the romantic models of Anton Bruckner and Hans Pfitzner. However, the impressions made by Bartók, Stravinsky, and Hindemith resulted in a change in Reutter's musical language. In the context of a dialogue with the music of his own time, he learned to express his own ideas and develop his own individual style. The works of this recording, although stylistically and chronologically distant from one another, present an unmistakeable manifestation of a strong and deeply human musicality, which discovers an authentic and sincere voice beyond any stylistic or national borders.